← Whats your story? Meet Julie! Me again! I feel terrible that its been so long since I have uploaded anything here. In truth life has been so full on and hectic over the last few weeks that I’ve not had the time to sit down and write anything. Poor excuse I know; do forgive me and allow me to share with you the manic life of Tom lately. Last month saw my first charity gig at Tomo’s Tavern here in Braintree, Essex. The night was a huge success and great fun was had by those who made it along. We had some awesome live music from Bob and Carol, Mark, Fire at Dawn, and of course the Red Indians. Paul and Al with the karaoke were brilliant, the raffle went down a treat, and of course the venue with their support were the best! As well as everyone having a great evening we managed to raise an amazing £587.81 which has gone to Crohn’s and Colitis UK to help in their amazing work. Thanks to everyone who had a part in this evening. Work has really picked up lately. As you can imagine the spring is the busiest time of year for us gardeners, and there’s been ample work with my new company CGM. We are taking on new contracts, and I am being given a lot of exciting opportunities to develop myself within the company. I love this time of year when everything starts growing; we really do have some stunning gardens on our round and its a pleasure to work in them. I have really hit the exercise hard. I have been training with a close friend of mine, Adam, who has researched fitness inside out over the years and really knows his stuff on the subject. Our training sessions started with me sending him a link on Facebook that was all about a press up challenge, where you do 200 press ups a day for 30 days straight. He was up for it, and next thing I knew we were doing the challenge. Nearing the end of the challenge we were looking for something else to take over. Adam’s suggestion was the 300, which intrigued me. 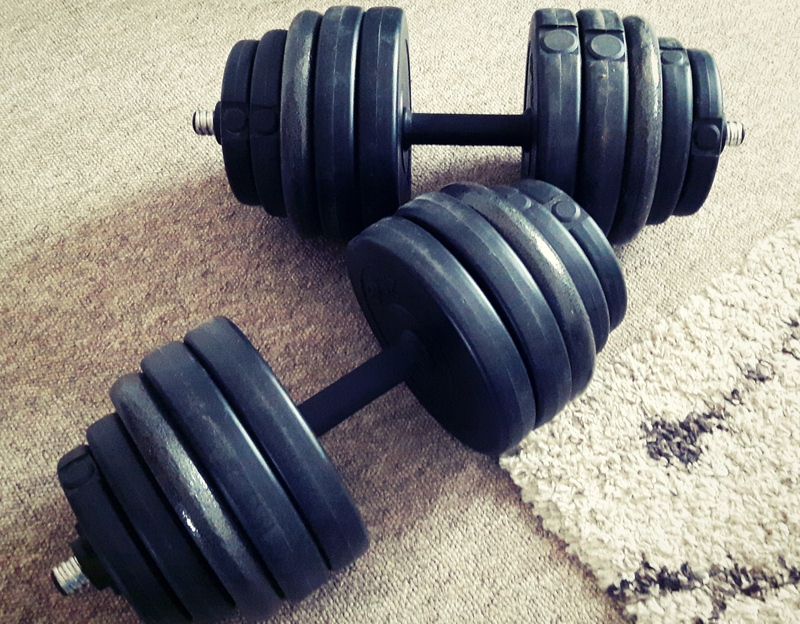 Essentially the 300 consists of 6 body weight and dumbbell exercises every day, with 50 reps of each exercise giving you 300 reps every day. Each of the 6 exercises focus on a different part of the body – the arms, shoulders, chest, back, abs, and legs. Now this challenge has been completed by both of us. We have taken a week off, to give ourselves time to recover and for the muscles to rebuild. I’ve learnt from Adam about “over training” and how much of an impact that can have on you. Sunday we started on a proper work out routine, which consists of mainly weight training initially to improve strength. Adam is advising on the routine and will has been giving me pointers on technique etc as well giving me encouragement as has my bestie Sara, who is also training with us. Of course I can’t do an update on here without mentioning the tummy! I am pleased to say that on the outside all is good. I am feeling healthy and happy, with no real problems to report with the stomach at all. I am due to go for some blood tests this week to check that I am OK to start back on Azathioprine. I had another “photo shoot” (colonoscopy) a little while ago which found that the ulcer I previously had has disappeared, and that another on had appeared, suggesting that the Mezalazine I was on wasn’t as effective as they had hoped, so as I suspected my medication needs to change. Well there’s a little insight to the mad world of Tom, thanks for reading again! Have a great day and I hope to write to you again soon. This entry was posted in Crohn's Diary, Exercise, Fund raising and tagged Crohn's Disease, Crohns and Colitis UK, Diary, exercise, KBO, Over training, Weight training. Bookmark the permalink.